305mm discs plus 6 Pot Calipers can only mean one thing! This kit does not contain Brake Pads unless a Pad option is selected (please choose the pads required from the drop down to the right). The K-Sport brake Kits you see here are the same Kits used widley in the various Time Attack series, slowing 800bhp monsters (like K-sport's own Subaru Impreza) giving you the confidence that these K-sport kits will provide the ultimate stopping power for your car. K-sport kits are designed to be an easy fit, requiring only a basic tool kit. Some vehicles may need spacers to ensure clearance between the brake kit and wheels (whether OE or aftermarket wheels). You will need 15mm spacers to fit these behind standard 17" wheels. Please Call for availabilty as there could be up to a 12 to 14 week wait for this kit if not available from stock. This can be upgraded to express order which is reduced to 30 days. The Pumaspeed Workshop team are ready to fit the K-Sport Fiesta Mk7 ST180 Big Brake Upgrade Kit 304mm in our Head Office located here. Therefore making parts and labour a total cost £1,095.00 (inc. VAT). 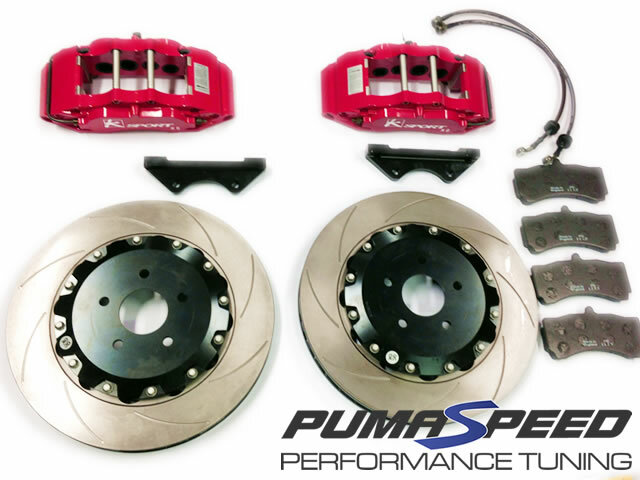 Pumaspeed have a specialist distribution team that can dispatch the K-Sport Fiesta Mk7 ST180 Big Brake Upgrade Kit 304mm to any destination worldwide.